I've watched this ad seven times, and I'm still at a loss for words. Clocking in at 1:53, it runs a bit long by most standards, but I could watch it over and over. 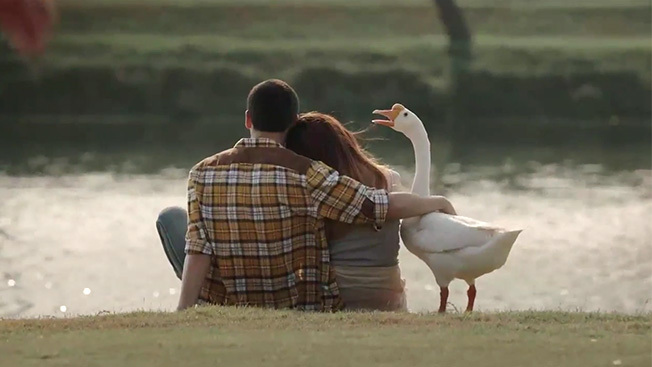 This spot, from Chinese credit card company QQ Caibei and Shangai agency Leagas Delaney, is a delightfully weird day in the life of a man and his pet goose, Ah Fa. Why have a pet goose? The ad makes a pretty compelling case. This bird can really do anything. It's a beer opener, remote-control airplane, alarm clock, boat motor, car jack, table tennis whiz and much more. He's probably the best pet anyone could ever ask for. So, how does this all tie in to a credit card? Well, this ad is promoting QQ Caibei's point system, which, once accumulated, affords the owner limitless possibilties. "When one can do many things, it makes life easier," says the headline of the ad. Just take a look below and see for yourself.